Ypsilon 5 from Sweden delivers a set of solid trance tracks, themes ranging from night-time stompers like Hologram Infection to true old-school influenced morning trancers like Beta Pictoris and massive stormers like Ground Zero and Cosmic Psychosis. Looking for a journey to the world of intensive psy-trance with acid-sounds, sci-fi speech samples and loads of thrilling melodies? Then check this one out immediately! Tranceform Records originally released Binary Sky in 2004 and it appears here with the full support of the label. Mastered by Luru at Kilon Bassopaja, Espoo, Finland with artwork by Monowaste Studios. MP3 Download | FLAC Download | WAV Download · Download count: 7,838. I can’t believe it!! Thanks Guys!! Why not tagged as Classic? 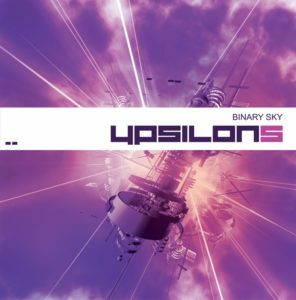 Ypsilon 5 was one of my favorites from mp3.com. Nice to see Binary Sky on ektoplazm, I got it on CD when it came out and its been in regular rotation since I got it. Highly recommended! Just Beautiful!.. Well done all round. Goa live’s! !